THIS EVENT HAS BEEN CANCELLED DUE TO WEATHER. PLEASE CHECK BACK FOR THE RESCHEDULED DATE. We hope to see you at our first Cocktails & Conversations at the new Port KC designed by KEM Studio. Historically, the physical port of any city was the first impression for travelers and was a meter to the economic vitality of the region. 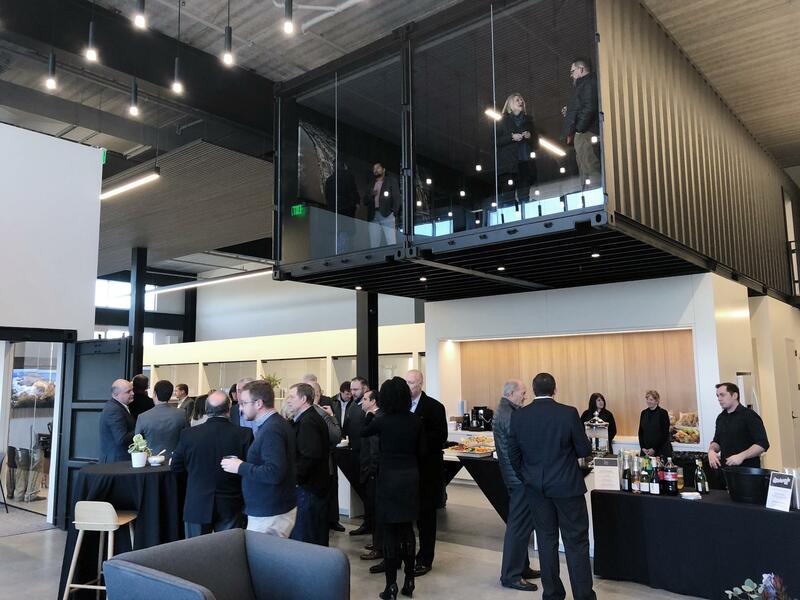 In designing the office space for Port KC, we considered this history, and conceptually designed the office as a "PORT" for this hub of activity. Port KC's mission is to foster the economic vitality of Kansas City, Missouri, through transportation, trade, commerce and development. The space needed to act as an office for 16 employees and function as a place to hold large public meetings + social gatherings. It needed to inspire employees to work differently and provoke stakeholders to see the potential of Port KC developments. In the existing 6000 sf space, we took advantage of the 22' tall ceilings by reusing two 40' long shipping containers to create a second-floor mezzanine. The containers house a private conference room that cantilevers above the kitchen and overlooks the "PORT" social gathering space. The steel containers act as bold and unconventional move that speaks to the industrial nature of Port KC's work in transportation and trade. A fresh palette of white and grey, with accents of white oak and Port KC's brand blue, are a nod to the refined nature of their commerce and development projects. The clean gallery wall along the public circulation presents an opportunity to connect Port KC with KC's creative community via a curated, rotating gallery of local artists' works. The bold, communal and informative space was designed to conceptually embrace and physically enhance Port KC's mission.